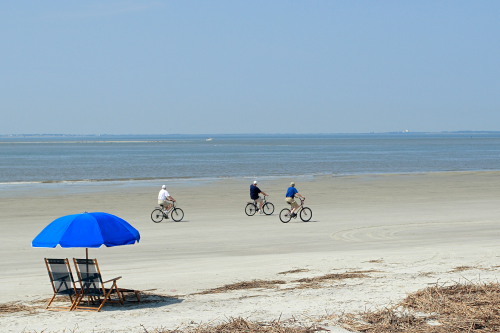 Riding a bike on Hilton Head Island can be an adventure for your whole family. The flat landscape, over 50 miles of winding bike paths, and the 19 miles of densely packed sandy beaches, provide plenty of places to ride. There are continuous bike paths leading you to beautiful landscapes, and hidden historical sights throughout the Island. The Town of Hilton Head has gone to great lengths to provide safe and well maintained bike paths along all of the main roads. These paths also extend into the gated communities where many of the vacation homes and villas are located. Guests can enjoy the ease of riding their bikes to the grocery store, a variety of restaurants, the beach and many different entertainment areas –and all can be done with the warm sun on your face and the sea air blowing through your hair. There are a number of bike rental companies located on Hilton Head Island. If you order your bikes ahead of time, most companies will have your bicycles waiting at your home or villa before your arrival. Check out our Island Services page for a list of our partners who can provide you with bikes and helmets. You can even try out a variety of different styles of bikes such as tandem, adult tricycles and recumbent bikes for the beach. Make bike riding your next great family adventure on Hilton Head Island!!! Stay tuned for next week’s blog…Get Your Plaid on for the Verizon Heritage!!! Why Stay in a Vacation Rental on Hilton Head Island? — Come “Get Your Plaid On” at the Verizon Heritage!! !